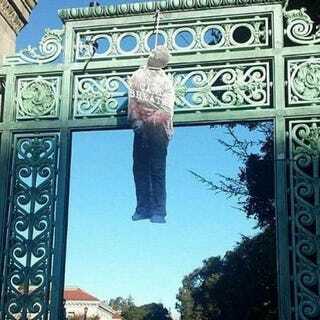 The Associated Press is reporting that three cardboard cutouts of black people were found hanging by nooses Saturday on the campus of the University of California, Berkeley. University spokeswoman Amy Hamaoui said police are investigating the incident to determine who hanged the effigies, which were found at two prominent campus locations Saturday morning, the report says. The spokeswoman told AP that the effigies appeared to be connected to a nearby noon-time demonstration that coincided with #BlackLivesMatter protests around the country. The effigies appear to be life-size photos of lynching victims. Two depicted men, and a third was a photograph of a female victim, the report says. The effigies had names of lynching victims and the dates of their death. At least one effigy had "I Can't Breathe" printed on the front, the report says. "We are unsure of the intent," Hamaoui said. Organizers of the Berkeley protest were also confounded by the offensive imagery, which has deep roots in America's racist past, especially in the Reconstruction era, when blacks were lynched as a measure to exert white supremacy. "We just hope it's someone who wanted to bring attention to the issue," Spencer Pritchard, 21, a U.C. Berkeley student and an organizer of the demonstration, told the news outlet. He said about 200 protesters demonstrated in Berkeley with the goal to "disrupt business as usual to show that black lives matter," the report says.